In the wake of the Charlie Hebdo shooting in which 12 members of a racist imperialist satirical magazine lost their lives, the website Systemic Capital published an image deemed offensive for at least two people. A friend of mine was asked to apologize for sharing this photo on Facebook because of its supposed offensive nature. Bowing to peer pressure he did so, but I think it was out of an authentic desire not to offend someone. I am certain his apology was genuine. As for the image itself: When the shooting took place the hashtag #JeSuisCharlie became a trend on Twitter. For those unfamiliar with French it means “I am Charlie”. It is a message in support of those at the magazine that were killed. There were those of us on the actual left (meaning liberals are excluded) that did not fall for this ploy to suppress criticism of the racist magazine and join in solidarity with imperialism. Systemic Capital to their tremendous credit also did not fall for this. In reaction they posted a picture of a North Vietnamese Soldier from the Vietnam War with the words “No, I am Charlie”. The message Systemic Capital was putting out was quite clear. 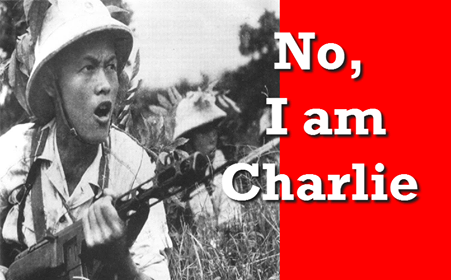 It was a parody “I am Charlie”, a pro-imperialist message made into an anti-imperialist message by standing in support of the Vietnamese liberation fighters against U.S. occupation. “Charlie” was the short form U.S. military call sign for “communist”. In this particular case it was “November Victor Charlie” or N.V.A. meaning North Vietnamese Army. This was an excellent parody turning the pro-imperialist message on its head. It seems as though despite its obvious correct anti-imperialist message, at least two people were offended by it. One of those people was someone my friend knew. The other was some anonymous commenter on a certain Maoist Third-Worldist blog. My friend is a member of that organization and apologized to the person it offended. Another person in the same organization had a similar image for which the blog apologized. I told my friend not to apologize for it. There was nothing offensive about it. Well, nothing offensive to anyone who wasn’t on the wrong side of history in that conflict. Both people who made complaints claimed it was racist. I disagree and I will lay out why. imperialism, that you proudly refer to yourself as an enemy of imperialism. This would be particularly so if you were Vietnamese yourself and opposed to U.S. imperialism being carried out against you. The typical reply to this would be that the person was offended so therefore you should apologize. This is not an argument, this is complaining. One must provide an argument as to why something is offensive, and offensive enough to justify an apology. Someone being offended is not enough, by this logic I should apologize to Western Vietnam War veterans for standing in solidarity with the people they sacrificed to fight. Being offended is not enough, one has to provide reason and argument, not simply subjective hurt feelings. I am offended by people who claim to be offended by me standing in solidarity with the Vietnamese or other occupied people. Why? Because it serves to justify their suffering. “You aren’t allowed to be against the unjust war and murder because I’m offended!” This is essentially the Israeli Zionist line of defence. The attempt here by those who demand an apology, and those who agree with issuing an apology, is to equate support for the Vietnamese national liberation resistance to FOX News type Islamophobia. When FOX News attacks radical Islam it actually attacks all Muslims. It takes criticisms of Islamic fundamentalism and applies it to all Muslims in general. To compare this outright prejudice to standing in support with oppressed peoples is disgusting and dishonest. No, they are not the same. This is my argument against the claim of racism. Anyone can be offended by anything. Being offended doesn’t determine if something is oppressive or not. I would argue that not being allowed to stand in solidarity, or at least lend moral support to the Vietnamese against colonialism and imperialism is oppressive, as it aids actual oppression. It doesn’t just hurt my feelings so therefore it’s bad. This idea that anything that offends is automatically oppressive is nothing more than extreme liberal idealism. Whatever someone thinks is automatically material reality. This is even worse when it comes from people who declare themselves to be Marxists. Openly declaring anything that offends someone to automatically be racist is to treat people of colour like children. It implies that they cannot handle the real racist reality of society. It is to imply they cannot handle being offended when they experience it every day. It is insulting for a bunch of White liberal activists to treat people of colour this way. This idea that an apology should be given if someone is offended no matter what is piece of corporate capitalist culture. Anytime someone is offended by anything from a company an apology is issued and some kind of conciliatory offer is made. It could be a free sample, a coupon for a free burger or whatever. The customer maybe offended by anything. I’ve been through his before just as anyone who has worked a minimum wage job has. A customer is rude to you, you are rude back and they make a complaint. The manager chastises you even though he knows you did nothing wrong. I have no sympathy or desire to protect such a policy. It’s a corporate mentality to apologize even when it is not offensive or wrong for the sake of saving sales. I am not interested in avoiding offending everyone at all costs. I am interested in forwarding the revolutionary science of Marxism. I am not here to play “social justice warrior” where identity politics supersedes revolution. I do not allow such pitiful pandering to identity politics to infect my Marxist beliefs. You don’t get to call my, or anyone else’s resistance to imperialism offensive. I find your objection to my resistance to imperialism offensive.